This technique for understanding PowerShell’s Workflow is very much my own making. 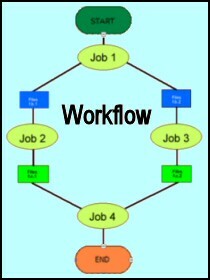 It is designed to illustrate the three keywords ‘Workflow, Parallel and Sequence’. Note 1: You need PowerShell version 3 or later. The only point of this basic example is to demonstrate how Workflow operates with a cmdlet or ‘wrapper’. Once I grasped this cmdlet / wrapper idea it was relatively straightforward to add ‘Sequence’ and ‘Parallel’ sections to my workflow. The underlying PowerShell task here is to execute Get-Process and then Get-Service, but padded with a few literal lines of "In x of y". In truth, this is an example to learn about workflow rather than performing any useful tasks. From a Workflow perspective, take the time to trace the three parallel items, and the two sequence items both in the script and in the results. Principle: Get this example working, then experiment by re-ordering the elements. "In parallel 1 of 3"
"In sequence 1 of 2"
"In sequence 2 of 2"
"In parallel 2 of 3"
"In parallel 3 of 3"
Note 2: Observe how ‘In sequence 2 of 2’ has to wait for Get-Process to finish, however, ‘In parallel 2 of 3’ does not have to wait. Note 3: It’s crucial to run Guy-ParaSeq on the last line. Note 4: I hope that these two examples will encourage you to experiment with the order of Parallel and Sequence items. A number of ordinary PowerShell commands give errors in workflow, the way around these difficulties is to employ InlineScript. "In parallel 1 of 2"
"In parallel 2 of 2"
Note 5: Observe how this script employs Start-Sleep to emphasise the parallel and sequence portions, if you don’t see what I mean then experiment by moving the commands around and pay attention to ‘In parallel x of y’. Good project management takes a task and breaks it down into steps, each with resources and a time-line. Workflow charts display which tasks can be tackled simultaneously, for instance fuelling cars at a big gas (petrol) station, and which are constrained by the need for activities to complete in sequence, for example, an insurance claim form. In script performance terms we can make gains by identifying which jobs can be executed in parallel. This pre-supposes that we are comfortable with PowerShell’s jobs, a factor which rules out PowerShell novices. I designed this page to illustrate the three keywords ‘Workflow, Parallel and Sequence’. Please remember that Workflow is only available in PowerShell v 3.0 and later.